Goin’ in for the Kill – whose tantrum is it? I’ll tell you. President Obama is calling it as it is: crap, frankly. Official photographic portrait of US President Barack Obama (born August 4, 1961; assumed office 20 January 2009). Photo credit: Wikipedia. Here’s the reality about the government shutdown. President Barack Obama speaks to a joint session of Congress regarding health care reform. Obamacare isn’t perfect, but it’s a start and it’s what we have left from Congress after Congress attacked the plan. To not have universal healthcare is a pity. It’s a shameful reality in the U.S. coming hopefully to a close. Now, as of today’s posting date, we have no government functions in most federal areas – why? Not because of health care. It’s irrelevant to the shut down. Due to ideological stupidity put in front of real persons with real health care needs. Everyone deserves health care. And it makes fiscal sense to provide it rather than deal with ALL of myriad results of NOT having it. How’s THAT for a damned caption? Photo credit: Wikipedia. I’ve found myself pointing all of this out for days and I’m saddened by the low or complete lack of understanding that most people have about what the “government shut down” is spurred by; what it affects; what it actually meant, means, and will mean; and how absolutely unnecessary it all was and is. I’ve got some things to say. I always do. If you knew, dear reader, just how many draft posts I have not put out there on my website you would see JUST HOW MUCH I have to say. But, I tend to write and then read it later and decide not to go there. I’ll be going there with this one. And I’ll also be going there with this one. If the United States government shuts down tonight and our economy takes a hit, it will be because House Republicans let it happen. Right now, there’s a bill sitting in the House that funds the government for a few more weeks. It doesn’t demand the repeal or delay of the health care law, or deny women access to birth control, or include any other failed, partisan proposals. It funds the government. That’s it. And if Republican leadership allowed a simple yes or no vote on this bill — like the Senate has — it would get enough support from members of both parties to pass. Instead, the government that these Republicans were elected to fund will close down and that will hurt our economy. Americans across the country won’t be allowed to show up for work. Paychecks could be delayed, meaning some folks will have to cut back on groceries or maybe even not pay a few bills. Businesses will have fewer customers. Veterans won’t get services they rely on — and it will put benefits for seniors at risk. Even though they’ve already voted over 40 times to defund or delay the health care law, this group of Republicans in Congress is so obsessed with the idea of sabotaging Obamacare that they’re willing to take the economy hostage to do it. Take a look at how this shutdown will affect millions of Americans — and then make sure you share it so other folks know, too. President Obama has said time and time again that he’s willing to work with folks on both sides of the aisle to grow our economy and even improve the health care law. But using the threat of government shutdown or defaulting on the bills our country owes is reckless and irresponsible. In fact, shutting down the government won’t stop Obamacare. The Health Insurance Marketplace will still open for business starting tomorrow, without delay. Washington needs to stop manufacturing crises and focus on the issues that matter: creating jobs and building a strong middle class. Taking our economy over the cliff just to score political points isn’t fair to the millions of Americans who show up every day to work and do their jobs. It’s time for Congress to do its job. Make sure you know exactly who this shutdown is directly affecting and then pass it on. P.S. — You’ll still be able to sign up for affordable health insurance on HealthCare.gov starting tomorrow, shutdown or no shutdown. Bill & Lou Need Your Voice – Use It Now! A college. An agribusiness program/project that uses animals as things rather than the sentient individuals who they are. The individuals? Two cows – Bill and Lou. Conflicting stories as to their fate – from the same institution telling the stories, all representatives of the college and the affiliated farm. And a group of concerned citizens who wish to know the truth. I am among that group of people. 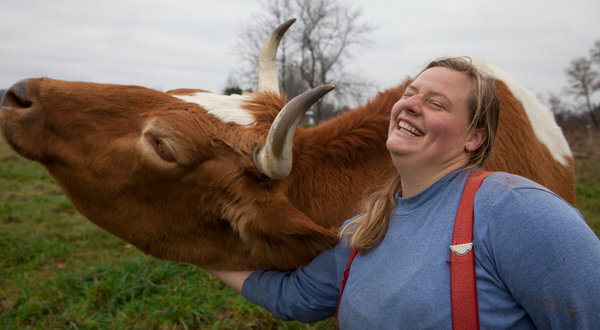 And I hope you’ll join me in urging Green Mountain College to be upfront in what it did with Bill and Lou – two cows whose fates were in the hands of the institution’s administrators. Their plight raised an international outcry. The school planned on sending them to slaughter and serve them to the students – yep, you heard me right. You might even recall that story as I remember it. Then school officials said they wouldn’t. Then Bill and Lou disappeared. Now sources within the school (Green Mountain College’s Cerridwen Farm) allege that Bill and Lou were sent to slaughter anyway. Wouldn’t surprise me even though that action would/will (?) stomp all over Green Mountain student body’s belief in its school administration’s integrity. Over 3 million voices were heard in 2012 before their deaths – make yours heard today. 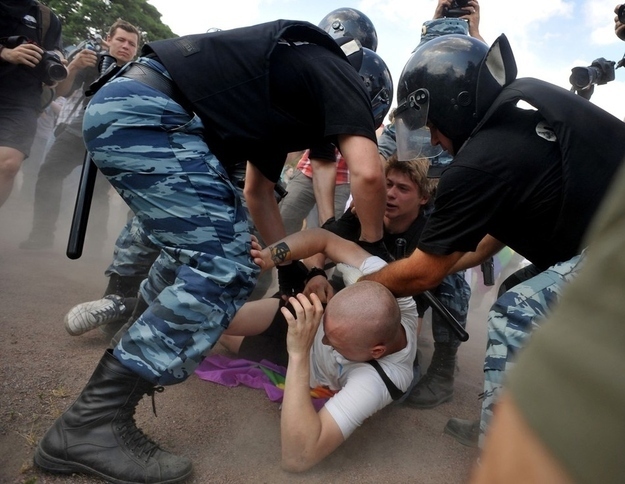 ‘A gay rights supporter is beaten to the ground’ in Russia. Credit: Olga Maltseva, Getty Images via Buzzfeed. Yes, I had some things to say about Russia’s leadership. OutJustice is my outlet for that type of commentary. Russia has a law criminalizing “propaganda” that shows LGBTQIA persons in a positive light. Anyone who participates in “gayness,” or says it’s pretty OK in some way (so to speak) is to be shut down. Violence? Sure, why not. Go ahead. Two women holding hands = crime. Waiving a rainbow flag = crime. During my time overseeing the undercover investigations at Mercy For Animals (MFA) we documented horrific animal abuse. Much of it so shocking it was featured on national and international news media. This photo being featured by People for the Ethical Treatment of Animals (PETA) on its Facebook page is from our (MFA’s) case at Willet Dairy in New York state. The photo shows a painful procedure called “disbudding.” This was one of our earlier employment-based cases (earlier = 2009, so hardly long ago). At Willet Dairy we documented “disbudding,” which is the painful removal of horns shown here without any pain relief or medical care. 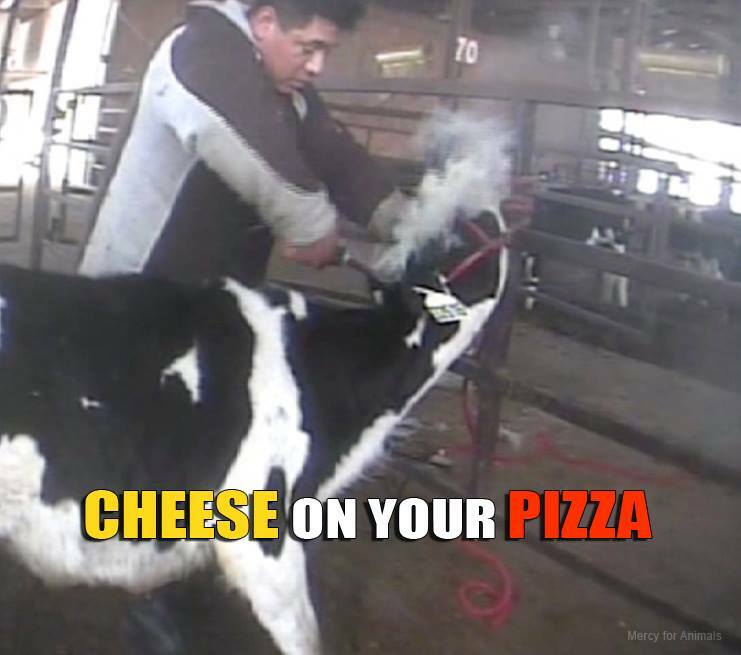 This is the Dairy Industry. 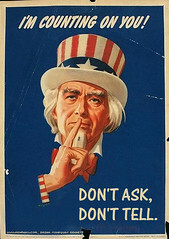 It doesn’t want you to know the truth. Using a cautering device, this worker digs and burns the horn out of calf after calf. According to dairy experts who reviewed the footage, these calves were all far too old for the procedure not that it’s any less cruel or painful at a younger age. Ag Gag laws are there to keep you from knowing the truth. You deserve to know the truth and these animals don’t deserve to suffer for absolutely no reason. 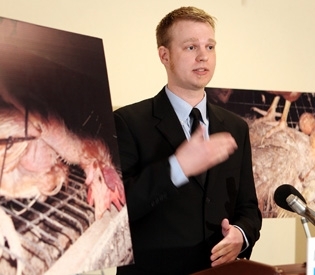 Former Mercy For Animals [sic] (MFA) US Director of Investigations Daniel Hauff speaking to reporters at a Boston news conference following the Quality Egg of New England investigation, a Maine Contract Farming facility owned by Austin “Jack” DeCoster of the salmonella outbreak. MFA could be stronger if they do the right thing. I suppose I should share the letter I wrote to Mercy For Animals‘ Executive Director Nathan Runkle about his and the organization’s unethical behavior. You can write to Nathan directly at NathanR@MercyForAnimals.org.